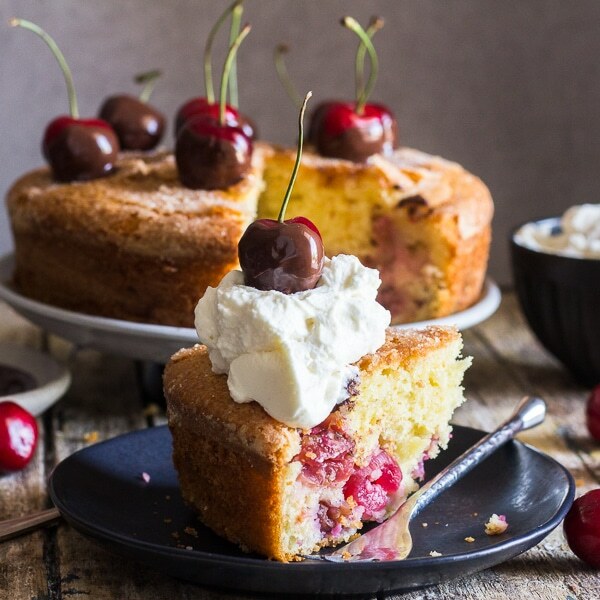 This fast and easy Cherry Cake is deliciously moist, made with yogurt and bursting with fresh cherries. Serve it plain or with a dollop of whipped cream and a fresh chocolate dipped cherry! When we think of summer food what do we think of? BBQs, Ice Cream and of course all the amazing fresh fruit. From Peaches, to Watermelon to Cantaloupe to yup, one of my favourites Cherries. So needless to say I had to make a cake with Cherries. When it comes to cherries I adore fresh cherries not candied cherries or Maraschino Cherries. Nope fresh all the way. The only thing was pitting them seemed to be a big project in my opinion! But surprise surprise it wasn’t. from a chop stick to an actual Cherry Pitter to what I used. One of my newly acquired Stainless Steel Straws . Because not only are they great for the environment but they make the best cherry pitters! Just remove the stem, stick the straw through the top and gently push to remove the pit. Worked every time! I remember back in Toronto when my sister had the most amazing Cherry Tree! The tree was full of cherries every year! So of course when I moved to Italy I told my husband we had to have a Cherry Tree, unfortunately I think that tree has been listening to our Lemon Tree. The thing is huge but if we get 3 cherries we are lucky! Although the blossoms are absolutely gorgeous the beginning of Spring. 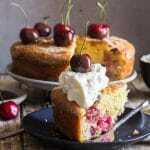 This Cherry Cake Recipe is very easy, full of cherries and deliciously moist. It’s perfect on it’s own, with a cup of tea or coffee in the morning for breakfast (Italian’s love a slice of a simple cake in the morning) or snack in the afternoon. Or why not serve it extra special with a dollop of whipped cream and a chocolate dipped cherry on top for dessert! However you serve it I hope you enjoy it! Buona Domenica! 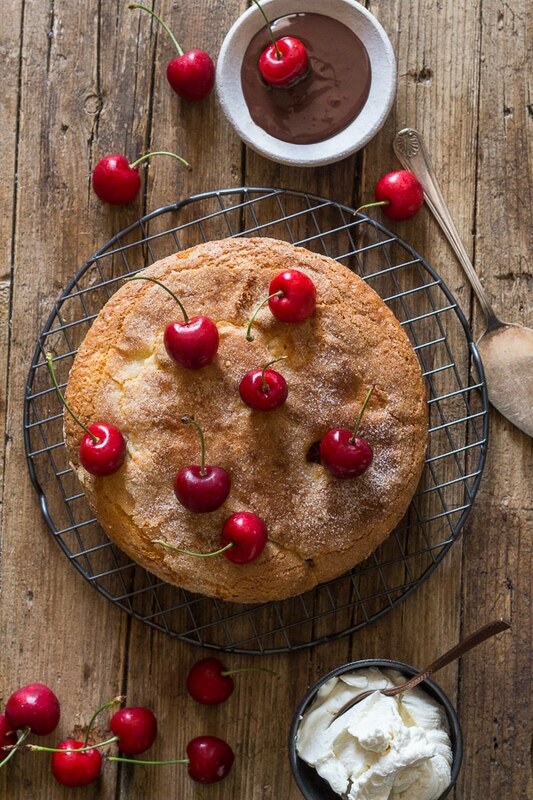 This fast and easy Cherry Cake is easy and moist, made with yogurt and bursting with fresh cherries. 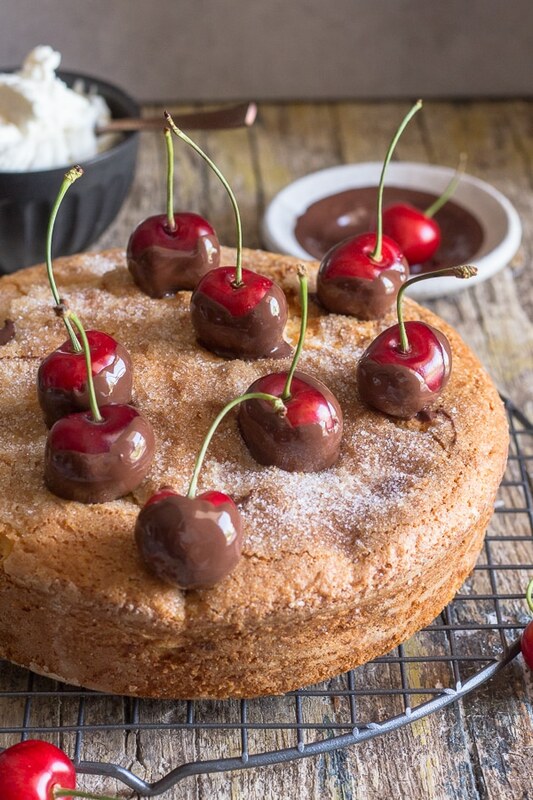 Serve it plain or with a dollop of whipped cream and a fresh chocolate dipped cherry! *Remove from fridge 30 minutes before using. Pre-heat oven to 350F (180C), grease and flour an 8 inch cake pan (springform pan is the best if you have it). In a medium bowl whisk together flour, baking powder and baking soda. In a large bowl beat on medium speed the eggs and sugar and until light and fluffy, (approximately 2-3 minutes), then add the zest and vanilla beat for one minute, then slowly add the vegetable oil and continue beating. Add the yogurt and milk and beat to combine, add the flour a third at a time, beating after each addition until smooth. Add half the pitted cherries and pour into prepared cake pan, top with remaining cherries, press down slightly with a spatula. Bake for approximately 40-45 minutes. Let cool completely before serving if desired top with whipped cream and chocolate dipped cherries. Enjoy! Hi, do you think this could be made with drained canned cherries? Hi Andrea, I think it would work if you drain them well. Let me know how it goes. 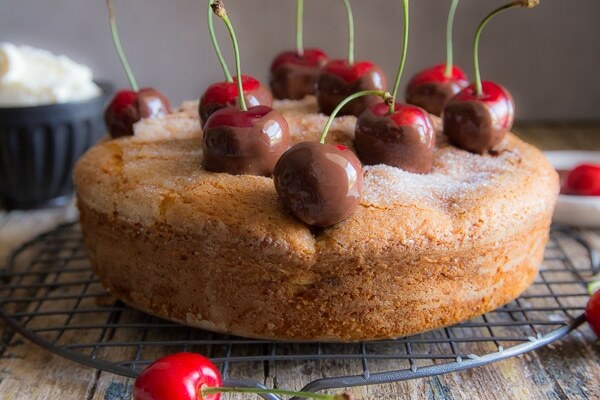 Hi : I followed your recipe and tried to make the Cherry cake. 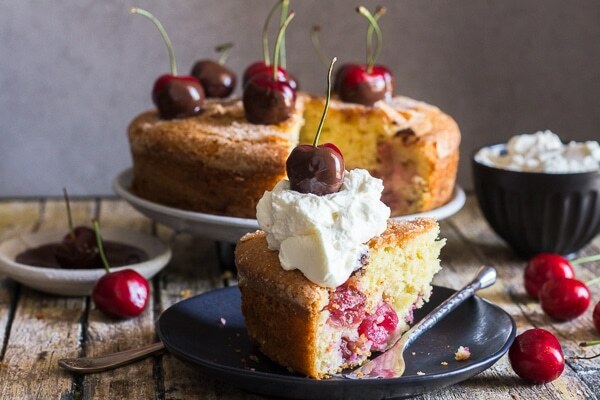 However at the completion of the 40-45 min bake time, the top of the cake appeared to be cracked and apparently the top layer of cherries was visibly standing out. I did use a spatula to pad the top cherries down a bit but I did not fully submerge them in the batter prior to putting it in the oven. I am wondering what I did wrong. Thanks for your kind attention! Hi Michael, my cake was actually a bit cracked also from the addition of extra cherries, it could be you added more than I did and or you didn’t push them down enough into the batter. Hope that helps. Ahhhh I guess I was a bit greedy in the Cherry department. I’ll try again and report back. Grazie mille Rosemary! Hi Michael, haha maybe, let me know.